Barack Obama considered it a failure when the Democrats lost control of the House, and had significant losses in the Senate. The House Republicans' first act? To repeal the Obama healthcare reform bill, thereby undoing six months of bi-partisanship and working together. The sad thing was, they might have succeeded. And then Jared Loughner shot up a Safeway and everything changed. One week ago, House Speaker John Boeher said that the Republicans were about to introduce a bill that would repeal “Obamacare.” Now, with Rep. Giffords still in hospital, they are putting their plans on hold out of respect for her. My question to the Republicans is: where is that kind of respect the rest of the year? Only when a politician is shot in the head does it seem to come out. Where was it when Obama was called a liar? Or a Muslim (as if that was a negative thing)? Or a socialist (which many on the far right still believe). Surely, we don’t need the death of nine year old girl to bring us together. Another point in Obama’s favour is gun control legislation. While there is no bill in the House or Senate on this particular issue, it is being talked about so much right now, that somebody somewhere will have to do something about it, thereby igniting a debate and taking focus off the idiotic repeal of the healthcare plan. Also, the fact that Sarah Palin said we should still own a gun and shoot things, might turn many off if she decides to run next year. But the number one point in Obama’s favour: the speech that he gave on Thursday at the memorial service. Long known for his eloquent oratory skills, the President was praised by nearly everybody (even Fox News, albeit briefly) for a great speech. He didn’t play politics, he didn’t push anything, he simply said that we need to stand together and then gave an update on Rep. Gabrielle Giffords’ health. I’m sure this is not what Jared Loughner was thinking would happen when he marched into the market with a gun and went crazy. He thought that he would kill Giffords. Now the country is rallying around her. He did prove one thing however: politicians only care about the other party when it’s politically viable to do so and they have no other choice. Perhaps this is what Loughner was thinking. 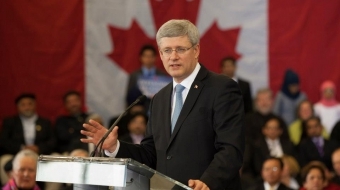 How much did Harper spend on Keystone XL pipeline promotion?